I’d planned to do a different blog post for today, but my workspace re-arranging has been really slow, so things didn’t pan out. But as I have nice clean windows and more space, while it was bright and sunny yesterday, I thought I’d take the opportunity to do a few practise videos. Videos are a bit out of my comfort zone! Of course, that didn’t turn out as expected either, the first one was too dark; on the second one I lost track of how many layers I’d done, and my neighbour called round and rang my really loud and annoying new doorbell! Third time lucky? Not quite, the camera battery ran out before I’d finished 🙂 I think I got enough info from it though to make notes on things to change, for example, maybe when laying out the left hand side, I could spin the layout around so that my arm isn’t in front of the camera. I’d planned to add captions when I edit the ‘proper’ video, but maybe it’s self explanatory? Also, I’d originally planned to edit out all background music and noise – I live near a main road and it is really noisy, but when I took off all audio, it was a bit weird. Have a look and tell me what you think. I finished the layout while the camera was recharging. 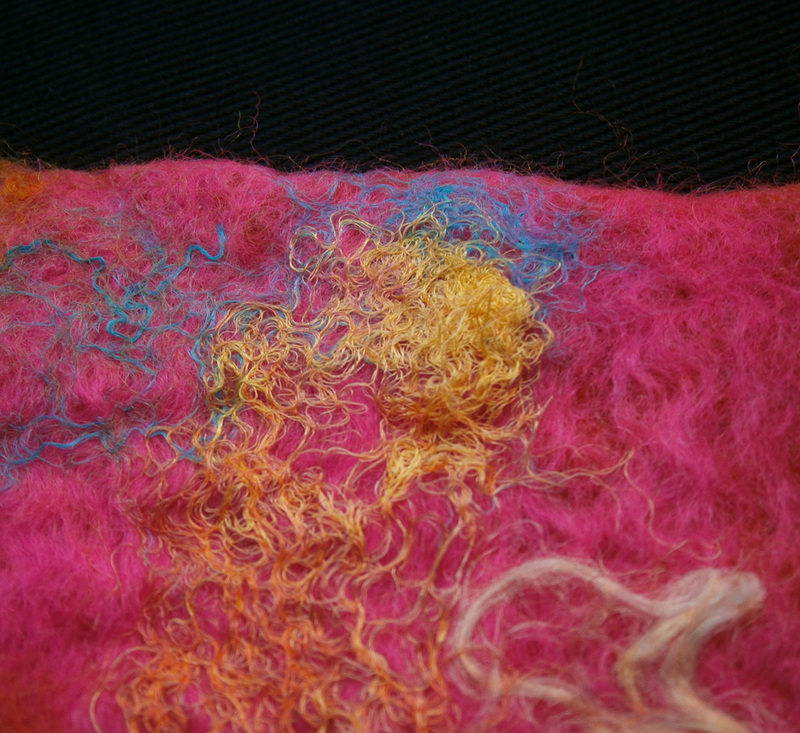 I added some fibres, all hand dyed, mostly viscose, soy and nylon staple, with some silk throwster’s waste. I didn’t charge it long enough though, because it ran out just before the end again! There was only the rinsing left to do though. I think a video of the wet felting process needs a few captions even though it is pretty self explanatory too. It’s probably about as interesting as watching paint dry, but if you want a look and offer any opinions, please do! I might have got carried away with the fibres, but there were so many nice colours! You can’t have too many can you? What have you done outside your comfort zone, lately? 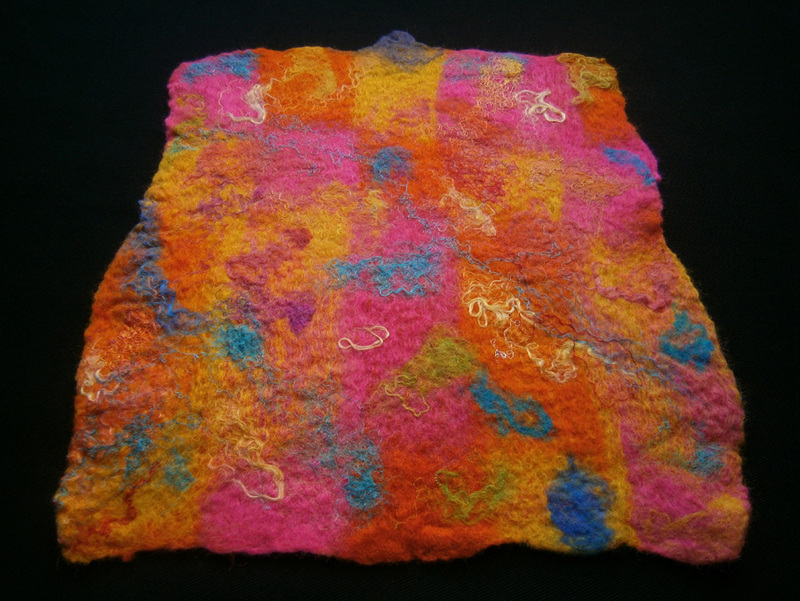 This entry was posted in Wet Felting and tagged wet felting, wet felting layout, wet felting technique, wet felting video. Bookmark the permalink. The ones I’ve watched have a lot of talking. My accent is too strong for that! I don’t think there are similar ones because the ‘real’ one will be a bit more specific in content, but it’s a good idea for knowing what not to do. Yeah, my process has evolved too. I often get asked at groups about my process, and when to stop felting, when to full etc and can only really say ‘be methodical’ and ‘you just know’, I can give myself tips from the vids now! I like to get the edges sorted straight off, then they take care of themselves. Great videos Zed! I would definitely add captions even though you may think it is redundant. It helps set things in people’s minds exactly what step you are completing and where they are in the process. I might add some “free music” to the video. Then people can listen to it if they want to or just turn off the sound. In regards to the camera battery, can you record and have it plugged in? That’s what I do with mine. Usually what I run out of is space on the recorder. I think I was worried about captions interrupting the ‘flow’ of the video, especially if I have to add in frames, but if I position it right so there’s space to add at the bottom, and keep them short enough to not be distracting that’d work. P.S. You should add these videos to the tutorials page. You’re very brave! 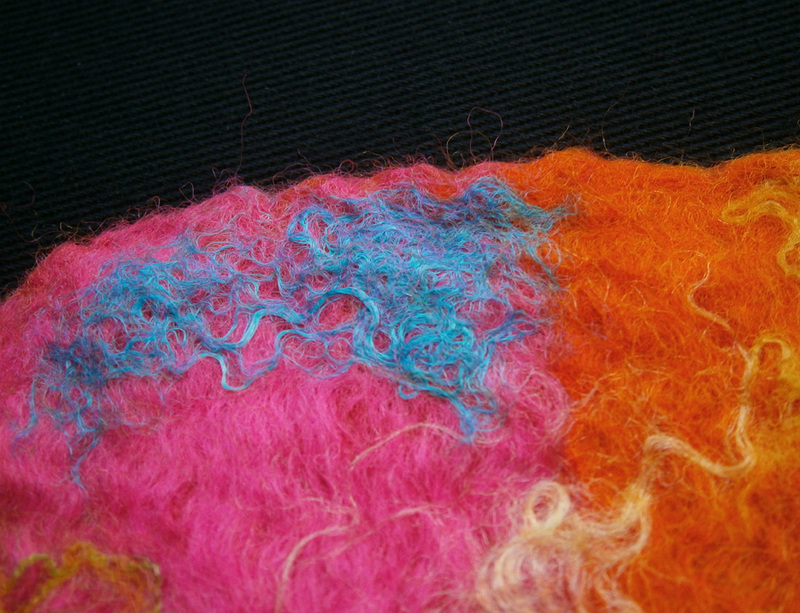 Both videos are good quality and the resulting felt is pretty- lovely colour mix. Captions would be a good addition and hearing your choice of music and the rub-a-dub-dub of the bubble wrap was engaging – liked it – showed the felter as well as the felting. As a felting newbie I found your video very helpful to watch thanks Zed. Most videos I’ve seen speed up the process and don’t convey such a sense of creativity. I would like captions too. 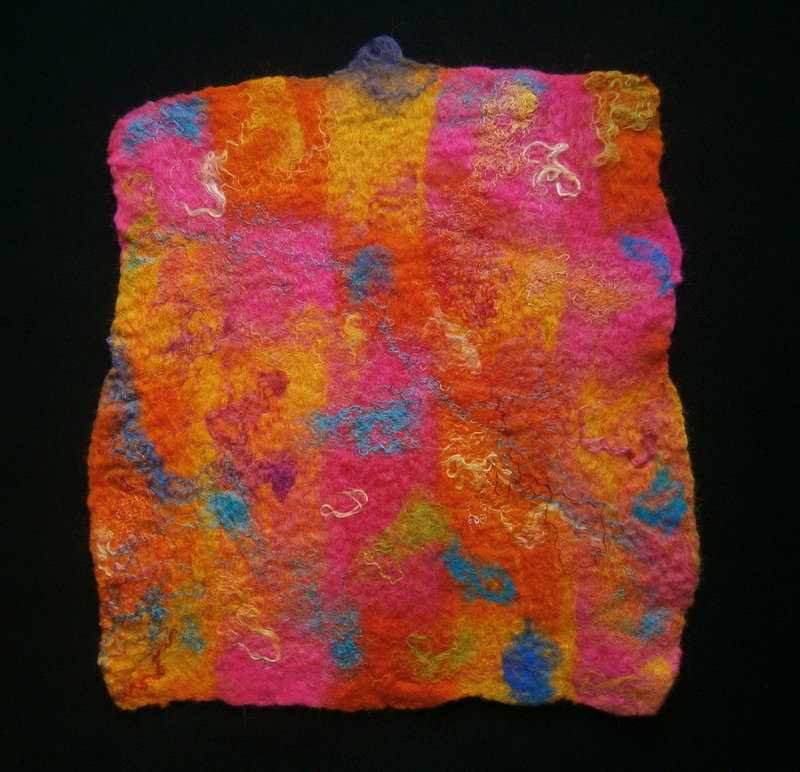 The finished piece of felt is beautiful, what will you do with it? Great job with the videos.to Bad about the batteries. Maybe some public domain music for the video. Still on my list of tings to do.